OM VISA Consultancy - Global Immigration, Students, Visitor, Business & Work VISA Consultants: Know More about Study in DENMARK with OM INTERNATIONAL...!!! 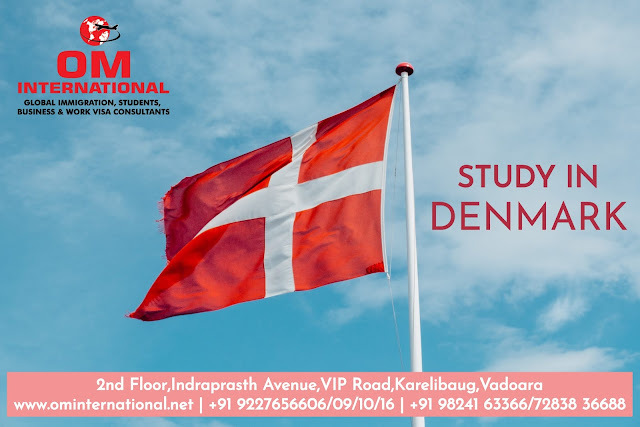 Know More about Study in DENMARK with OM INTERNATIONAL...!!! Denmark is a Highly productive and streamlined country, Denmark has a reputation for academic excellence. Partner this with the beautiful scenery and high-quality public services, and you have a fantastic destination for all international students. With higher education institutions dating back to 1479, Denmark has a history of providing education. Five types of institutions in Denmark. These are universities, university colleges, artistic higher education institutions, schools of maritime education and training, and business academics. Universities offer bachelor’s, master’s and doctoral degree programs in a wide variety of subjects. University colleges offer vocational professional courses, preparing students to go into a career. Artistic institutions are specialist schools offering art and design courses. Maritime education and training institutions offer research and practice focused courses. Business academies offer two year Academy Profession programs and Professional Bachelor’s degrees. There are 8 universities in Denmark, as well as many other higher education institutions. Will find 5 of Denmark’s universities in the 2019 QS World University Rankings top 500. The highest ranked is the University of Copenhagen, which is placed at 79th. The next highest ranked is the Technical University of Denmark, which is placed at 112th. Officially the Kingdom of Denmark, the country is home to over 5.78 million people. Denmark is a Nordic country and shares a border with Germany. The country is an archipelago of 443 islands, with a flat terrain with sandy coasts, low elevation, and a temperate climate. In 1397, Denmark was part of the Kalmar Union, which also includes Sweden and Norway. In 1523, Sweden left this Union. Denmark and Norway remained under the same monarch until 1814, after the Napoleonic Wars. in 1973, Denmark became a member of the European Economic Community, now known as the EU, maintaining its own currency. Denmark was also one of the founding members of NATO, the OECD, and the United Nations. Not many people know it, but the educational system is not like the others. For example, when you go to a university you will discover that lectures are held in small groups instead of a fully packed class, and you’re sure to feel comfortable and at ease. -Unlike many European countries where wildlife is shrinking to make space for more of us, in Denmark you can get the chance to see elks, boars, wolves, and brown bears, rabbits, hedgehogs, foxes, squirrels. And you should hurry, because Denmark is not immune to wildlife extinction. - Denmark is one of the most socially progressive countries in the world. If you’re curious about alternative ways to create a successful society, Denmark will be a fascinating country for you to study abroad. The tuition fees you pay will depend on where you are from. If you are from an EU/EEA country, you are able to attend Danish universities for free. If you are from any other country, you will pay tuition fees. There are scholarships available for students, and these are offered by individual institutions, as well as other initiatives. Your living costs will depend on where you choose to live, as bigger cities will be more expensive than smaller cities and towns. On average, you should budget for between DKK 6,000 and DKK 13,500 per month. This accounts for accommodation, groceries, and travel. Another cost that students need to consider is health insurance. Whilst there are some circumstances where emergency healthcare is free of charge, you may need to be covered by a health insurance policy. Check with your institution about whether you need health insurance.if you are a Nordic, EU/EEA or Swiss citizen, you are able to work in Denmark throughout your studies, without any restrictions, but you will need a work permit. If you are from anywhere else, you will be able to work up to 20 hours per week during term time, and full time during June, July and August. You will also require a work permit.